School Headphones vs. Headsets - Headsets Direct, Inc.
With numerous choices, one of the first decisions between school headphones vs. headsets will be determining which better suits your needs. Even though they seem similar in nature, they function very differently. 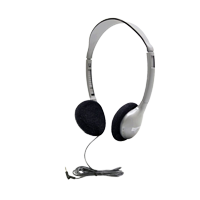 Headphones and headsets are similar in many ways; they have headbands that go over the head, speakers with foam/leatherette cushions covering both ears, and cables with PC/Tablet connections. The main difference between the two is that headphones only have speakers for listening, and headsets include both speakers for listening and a microphone for speaking. How you plan to use the headphone or headset will help dictate how you should choose between the two. It is important to not only cover your immediate needs, but you should also consider future applications, which may require a microphone. If your current application only requires listening, you can choose the more cost-effective option and purchase the headphones. The downside to this strategy is, if next year you implement software that requires a microphone, you will have wasted your initial investment, and you will need to repurchase headsets that include a microphone. How should you plan for future opportunities? Most applications in the past have only required the use of school headphones without a microphone. As software advances and more testing is being required in the school system, a trend towards school headsets with microphones is taking place. 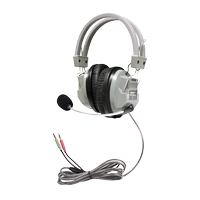 With a minimal difference in price, most school districts are opting for headsets to cover any future needs or requirements. This also simplifies deployment of models throughout your district. If you try and selectively buy headphones for only those labs or classrooms that don’t require microphone usage, you will have a mix pf headphones and headsets throughout the district with constant gathering of one style and dispersing others as needs change. Can you add a microphone to headphones? Unfortunately, because the circuitry and internal wiring is designed at the time of manufacture, you can’t add a microphone to an existing headphone. Your only option would be to purchase microphones as a separate device. This ends up being an awkward solution with two different devices trying to work as one and two cables to manage. Also stand-alone microphones act more like a speaker phone and will pick up your student’s voice along with any other sounds in the near vicinity. When using a headset microphone, the mic is close to your mouth, which limits the amount of background noise being picked up. Take away: The best approach, when comparing between school headphones vs. headsets, is to research current and future applications.